The effects of heterotransplantation on bone marrow structures were studied in experimental male mice. Suspension of the bone marrow from feline femur (1 ml bone marrow diluted in isotonic saline, 1:2) was injected into the caudal vein. Heterotransplantation led to an increase in the level of serotonin involved in cell differentiation. In 2 days, the counts of all cells except erythroid cells decreased. 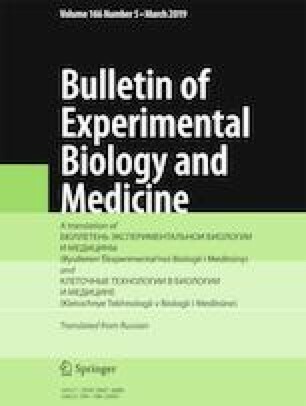 Immunohistochemical analysis of Ki-67 marker within 40 min after transplantation showed a significant increase of cell proliferative activity in comparison with that in intact mice. At later terms, the expression of Ki-67 in bone marrow cells decreased, while the expression of apoptosis regulator P-53 increased, which was associated with the presence of numerous dead cells.